If you compare logs, a lot of what we do as resto shamans is the same (You cast riptide and healing rain? Me too!). But details can easily get overlooked, especially when they are things that don’t boost your HPS(e) on World of Logs but do contribute to your team succeeding. Things like grounding totem, interrupting, windwalk totem, and helping slow/stun adds all fall into that category. In these “Tips&Tricks” articles I’ll also go over the more obvious stuff, like glyphs & talent choices that are viable for each encounter. There is no set order for heroics, but I’m going by the general concencus and kill % from easiest to hardest. This is by no means a complete list, hoping to edit this as more tips & tricks get discovered. If I missed anything please let me know! 1) Elemental Mastery works very well on this fight, since the big damage phase (Lightning Storm) is 90 seconds apart each time. You can alternate Ascendance & HTT for each Storm and have them all buffed with EM. 2) Dispelling strategies vary, but make sure you have tidal waves up right before Ionization goes out, and use Stone Bulwark / Astral Shift as he casts it and dispell yourself right away (if that fits in your groups strat). Hit yourself with a Surge or GHW then start topping off others, we can do a lot of healing when Ionizations are getting cleared, especially if you can catch them at very low health right after they’re dispelled. 3) Cleansing waters glyph could maybe be considered if your dispelling on c/d after Ionization, and it’s going rough for the group. It’s a small heal, won’t rock the meters, but will help people who are very low right after the dispell. 4) Healing Stream Totem is another strong glyph here, as damage to the raid is almost entirely Nature. 1) What your job is varies greatly depending on how many groups of flyers your guild is using, but if you’re flying one of the main benefits to take advantage of is getting Primal Nutrient from Feed Young, which is a 30% healing boost for 30 seconds, usually put to use during Quills (again depending on your platform responsibility). Pay close attention to your ability timers, you might have to wait 5-10 seconds to fly back up (on my platform Feed Young follows a Down Draft, popping feather about halfway through the DD works perfectly to get the buff and have a few seconds to spare), but it’s worth it to have 30 seconds of +30% healing, especially during Quills. HTT/EM | Asc | x | HTT/EM | Asc | x | HTT/EM You could use EM off cooldown in between Tides, but it wouldn’t be during a Quills, or if you backed Ascendance up one spot to use EM there, you wouldn’t get EM for HTT. AG/EM | Asc | AG/EM | x | AG/EM | Asc | AG/EM Also add Spiritwalker’s Grace in to every AG/EM combo. So if your group will get 7 quills, it comes down to 4 AG/EM combos vs 3 HTT/EM combos. I’ve used AG and am very happy with it on this fight, but will test HTT on future kills. If you are stuck on a platform during quills when your tide is up though, it puts you in a rough choice; either use it just to heal your 4 people, or save it and potentially get one less use of it during the fight (again, assuming 7 quills). I think this is one instance where the smaller, more frequent AG is a very viable choice over HTT. Obviously HTT works as well, but it’s a near-unanimous choice for resto shamans, so I feel obligated to put in a good word for AG when I can :) Perhaps I’m being too compassionate for ignored talents that I have a soft spot for. But try it! 3) If spirit link doesn’t have an assigned spot, and you’re flying, consider using it on one of your platforms. Using it for 4 people instead of on the main platform seems counter-intuitive, but if there are times where you need to fly to a top platform right before a Quills, the damage can be intense if you or anyone else cuts it close. 1) Don’t let other healers make fun of you because you can’t cleanse diseases OR poisons. Every class is special in its own way, make fun of them back for something they can’t control. 2) One of the biggest change from normals is the addition of pink dinos, here are a few macros for it. Flame shock is our cheapest shock, which is why I use that, and the dino can’t be slowed by frost shock. I mostly use shock but mix in some LB’s as well, especially since you can cast it while moving now in 5.3, and with Telluric Currents Glyph (highly recommend for this fight), it’s a mana gain as opposed to shocking taking 7k. So play it by ear, if you are short on mana mix in some LBs. Searing totem is also awesome to have to knock back the dino, just make sure to hit the dino once after putting it down (or have flame shock ticking on it), and don’t overwrite your Primal Fire Ele with it. I’ve heard wind shear works, and is 1k cheaper than flame shock, but since it’s a longer c/d and flame shock helps target your searing totem I went with that. Purge also works, and has no c/d, but the 10k mana cost is somewhat steep. Any of these work, I’ve found FS and LB work best in tandem for me, but whatever ya gotta do to back that dino up, do it! 3) Stuns for the smaller adds are very, very useful for the 3rd door, and can stop a lot of disease debuffs from going out. Have capacitor at the ready for that door, as well as your wind shear handy for every door since interrupts are an important part of success. 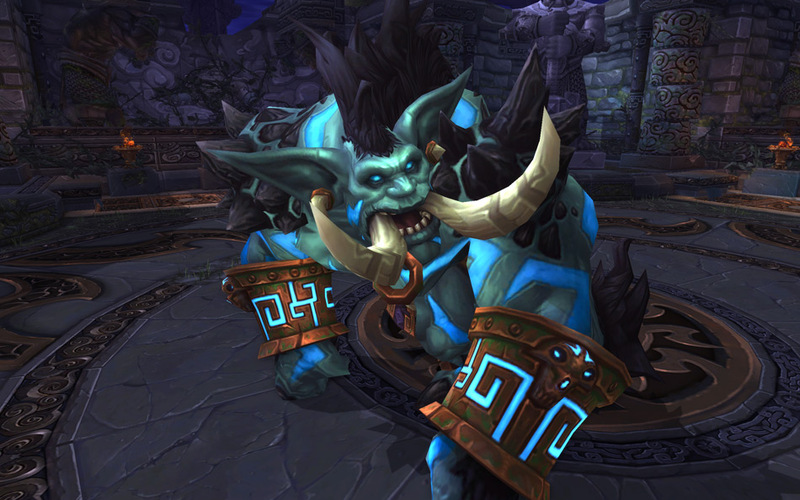 You should have dps assigned to interrupt rotations, but doesn’t hurt to keep an eye out and help them if needed. 4) Glyphing healing stream totem is very nice for this fight, extra protection against the major adds (nature damage from venom priests, chain lightning, lightning nova totem, frost from frozen orbs, fire from flame casters). 1) Listing sheild macros first & foremost, getting your shield and keeping it up is the biggest difference in heroic mode versus normal. Same basic premise as H-Horridon, using the shock is preferred since it’s an instant, but using LB is much better on mana with TC glyph. Difference is you can melee the crystal if you get close enough; DO NOT try punching your pink dino on H-Horridon. This fight can be mana-intensive so best to have both options. 2) Glyphing spiritwalker’s grace can be really useful here, especially if your 3rd glyph spot isn’t something you’ll miss. By the end of the fight whirling turtles can build up and be very difficult to avoid, so you might spend a lot of time bouncing in the air. An extra 5 seconds every 2 minutes might not seem like a lot, and it really isn’t, but I know for me personally it’s more than I get out of my 3rd glyph spot usually (my default go to is Healing Wave glyph if HST isn’t needed, and that can be 0.2-0.9% of my overall healing. So, yeah, not a big loss!). 3) Most likely for this you’ll be alternating HTT with Ascendance for the Quake Stomps, pop each the split second before Tortos’ cast finishes, so that it’s healing while you are stunned. When you are going to use your Ascendance, it’s a MASSIVE difference in effectiveness if you can put down a UE enhanced Healing Rain just before the Quake Stomp goes out. That will really maximize your time as a water Ascendant. 1) Glyphing HST is extremely useful in this fight, consider it almost mandatory during progression. With the T15 2pc bonus, you are throwing out a LOT of 10% damage reduction bonuses. Very good stuff. 2) Depending on how your group handles dispells, glyphing cleansing waters could also be an option. I would only do this if you’re one of the primary dispellers, since it is such a small heal, but it does help when dispelling low health people with cinders. Most groups I’ve seen have all healers dispelling, but 1-2 as primary ones who do the bulk of the dispells. If you’re not primarily on dispells don’t bother. 3) Make sure your raid frames are set up so that you can see the DIFFUSION debuff, it takes 10% of the healing you do that that target and spreads it to ALL allies within 8 yards that don’t have diffusion. Ideally when stacking for rampages, one tank and possibly one melee dps will have this on them; those are your primary targets. Once Healing Rain is down, either hit the diffusion carrier with single target spells or bounce chain heals off of them. Can make a massive difference in your HPS. 4) Grounding totem is useful on this fight as well, it can soak up an attack from one of the adds. While it might not seem like the best use of a GCD, the adds Nether Spike can kill if it targets a cinders kiter or someone at low health. Useful for any shaman to pop down while adds are out, if you have a spare global. 5) Capacitor totem + Totemic Projection for the adds, if needed (on 25man usually the dps have enough stuns to handle it). 6) Timing c/d’s between rampages can be a bit tricky (if your group isn’t coordinating them, which they probably are), since it’s not a set time but depends on how fast the heads die. When we first started working on it, I could depend on almost 90 seconds each between the first 2 sets of rampages (not quite, but almost), but as people have geared up that has gone way down. As most groups potion & heroism on the later heads, those times are even shorter. Keep that in mind when trying to map out how many Elemental Masterys & Ascendances you can squeeze in. Hopefully these were somewhat helpful. Lots of things to consider for each encounter and many ways to help the team succeed. Hope to hear more good ideas from you guys! You’re preaching to the choir about AG, I went into some detail in the H-Jikun section in favor of it (read around where the smiley face is), but thought using the same argument for Meg would be redundant. I always try to argue in favor of it to other resto shams, it seems HTT is near universal but AG REALLY shines in the right situation. Keep spreading the word and fight the good fight! Haha. For H Megaera, I’ve come up with what I feel is an optimal cooldown rotation. Rampage 6: Elemental Mastery + Ascendance, then Ancestral Guidance for the final 10 seconds.